Lochbroom Community Renewables Limited (LCR) is a Community Benefit Society which was set up by Ullapool Community Trust (UCT) to run renewable energy projects. LCR’s first project, to establish a small scale hydro-electric scheme on the Allt a’ Mhuilinn, was initiated because of strong local support for community-owned renewable energy schemes. An opportunity arose from an invitation from Forestry Commission Scotland (FCS) for communities to develop hydro projects on local, state owned woodland through the National Forest Land Scheme. 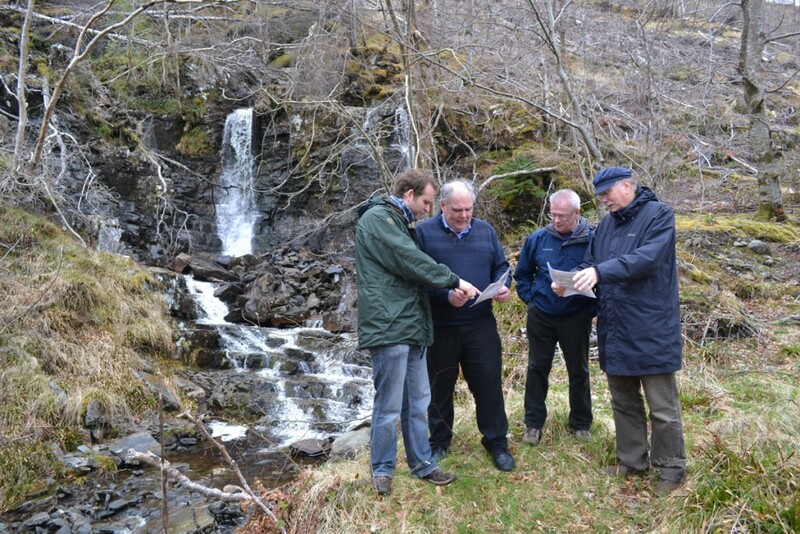 Two sites were identified and, after initial feasibility work, the Allt a’ Mhuilinn burn offered the most viable location for a small-scale hydro scheme. The burn is 9 miles south of Ullapool and flows down through steep woodland, crosses under the A835 into the river Broom and then on into Loch Broom (Loch Bhraoin, “loch of rain showers”). UCT’s Development Officer, Ewan Young, led the hydro project and babyHydro, a company specialising in the development of small hydro projects, were engaged late in 2012 to produce a preliminary assessment of the sites. The work was supported and funded by the Scottish Government’s Community and Renewable Energy Loan Scheme (CARES). Detailed feasibility and viability studies were commissioned through babyHydro. At this stage both the Allt a’ Mhuilinn and the neighbouring Allt a’ Braighe burn were thought to have hydro potential. The most viable scheme was found to be a small, 100kW, run-of-river system on the Allt a’ Mhuilinn burn. This was after careful consideration of the risks involved balanced against the best financial return for the community. This burn had a hydro scheme on it in the past which powered a timber saw-mill. Lochbroom Community Renewables Ltd was formed to take forward the project. This was necessary to be able to apply for charitable status and to be able to raise funds by a community share offer. We had discussions with SSE regarding a potential grid connection, selected and appointed legal advisors and started negotiations on a lease with Forestry Commission Scotland. 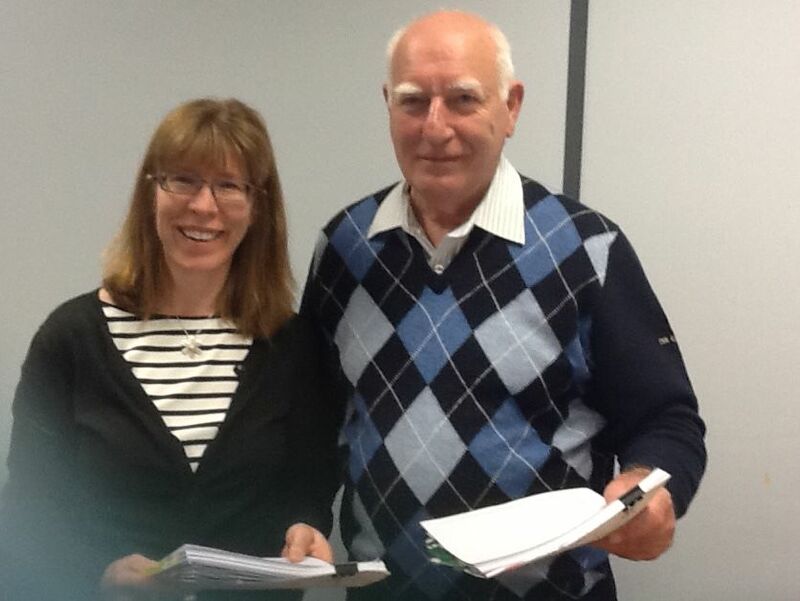 Local Lael residents were contacted as part of the planning process and their feedback was very positive. The necessary geo-technical, topography, ecology and other survey work commenced with the onset of spring weather. The best of two intake locations for hydro scheme on the Allt a’ Mhuilinn was selected and the necessary consents were obtained. Scottish Hydro Electric Power Distribution (SHEPD) provided on 15 September 2015 an offer of grid connection for 30 September 2017 reference EDY 615. This is for the full 100kW. Planning permission (Highland Council) was obtained on 29 September 2015 reference 15/02527/FUL. This remains valid for three years from this date, by which point works must have completed. Feed-in Tariff (FiT) pre-accreditation was acknowledged (date stamped) on 29 September 2015. This guarantees the electric tariff for the next 20 years, provided generations starts within 2 years. The Business Case and the Share Information Booklet were completed and the 41 year lease for the land around the Allt a’ Mhuilinn was signed with Forestry Commission Scotland. After 4 months of fundraising, the scheme reached its target funding of £900,000 on the 28th September 2016. There were over 450 investors, with the majority putting in between £300 and £2,000 each. 54% were from the local area and 46% from the wider UK and beyond, including the Netherlands, France, US and Japan. 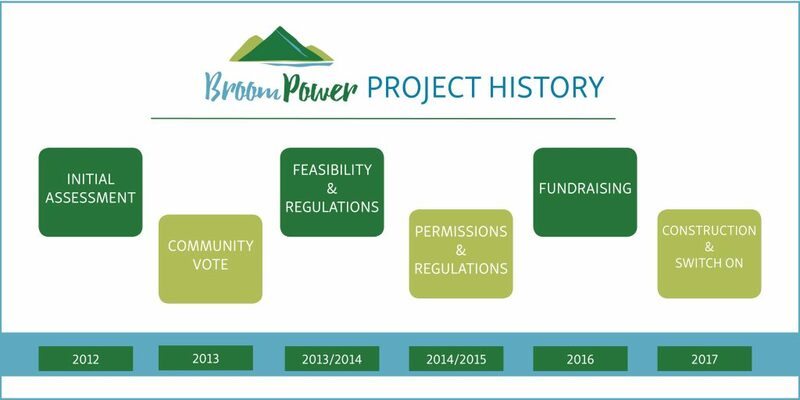 Many local investors did so on behalf of children and grandchildren highlighting the long-term community and environmental benefit of a community-owned renewable energy scheme. After many months of extensive planning and preparation work, construction of BroomPower hydro began in April 2017. Construction of the hydro was undertaken by a team of highly skilled experts, who were chosen by BroomPower operators Lochbroom Community Renewables (LCR) for their track record in building small scale hydro schemes of this nature. They included Edinburgh-based renewable energy specialists Locogen, designer Hugh Campbell of Campbell of Duone and construction contractor Bobby Ross Ltd. The official ‘cutting the turf’ ceremony for the hydro construction took place on 13th May at Braemore Hall, where local schoolchildren joined representatives of BroomPower and contractors to mark the occasion. BroomPower community hydro officially began generating electricity on 18th November 2017. A community benefit society is run primarily for the benefit of the community at large, rather than just for members of the society. This means that it must have an overarching community purpose that reaches beyond its membership. An applicant enterprise must also have a special reason for being a community benefit society rather than a company, such as wanting to have democratic decision-making built into its structure. Although a community benefit society has the power to pay interest on members’ share capital, it cannot distribute surpluses to members in the form of dividends.